I've brought the Island of Blood starter pack but have never painted models before, how should I start and is there anyone I can speak to for help and tips? I would love to learn how to play the table top game, whats the best way of learning, reading the rules and learning myself or? I would love to learn the lore behind WH, and the story behind it, wheres the best place to start and which novels to by? The best people to speak to are your local GW staff. They'll be able to start you off and show you tips, tricks and techniques as you progress. Alternatively, GW always used to have painting guides that got you started and showed you various techniques. My first tips are: Undercoat well (preferably with a spray can), be patient, aim for neatness, be patient and aim for neatness. It's amazing how much a few rough edges can spoil a great model, or how good a simple paint scheme can look when just done with crisp edges. Learning to game is easiest with a group. Either find a friendly local club (most should take beginners, but some might be more tournament-centric) or go to GW stores. They'll do intro games and games nights. You can learn a bit from reading the rules, but a real battle lets you learn the intricacies better. In terms of background then I'd personally say that the rule books and army books are the best sources, including the older ones. They tend to give overviews of races and the world as a whole, where as the novels give you more of a history of one character. 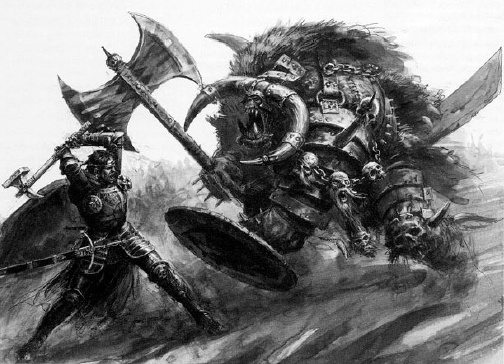 The Time of Legends books are good later on for more detail on the early years of the races, and I enjoy the Gotrek and Felix novels, but they're not quite so high on the lore-teaching scale. Then you say codex do you mean army rule book? Sorry for the nob question. Yeah, Codex is the W40K equivalent of a Warhammer Army Book. Either way, you need the rule book and the book for the race that you want to play. To help choose a race, check out the GW website, the lore behind the race and generally have a chat with players/staff and check out the models. TBQH I think you do. Some of us experienced players tend to become a bit grumpy when people expect us to be a "living rulebook". Also, call me cynical if you want, but I really wouldn't trust someone who said "trust me - unit X has special rule Y" (or stat Z or whatever). They may tell the truth some of time, but there's always the potential for mistakes even if you ignore lying, and I'd rather they had a reference book to show it if necessary. IMO they're a bad start when you very first begin. £15 isn't much in the grand scheme of an army, and you need to know your race before you start to make a real army. Given that you can read the army book at your leisure and get an idea for the background, as well as planning lots of different combinations and seeing what looks good, then I'd recommend waiting an extra month to buy your next unit and buying the army book instead. $124? Seems a bit steep; it's only £45 in the UK. I'd still say that it was quite important, though, as you need to know the rules. You might be able to get started with an experienced player, but reading the rules and referencing them is always useful. The best way is normally to split the purchase with someone else and share the rulebook. It used to be even easier in the old days when £40 (or even £30, IIRC) got you the rule books and two armies, so you each had the starts of an army from the purchase as well. IBBoard wrote: $124? Seems a bit steep; it's only £45 in the UK. Australian dollars I assume. GW hasn't noticed that the pound is worth a fraction of what it used to be vs lots of other currencies. It's actually almost 50% cheaper to buy stuff through the UK and have it shipped to Aus/NZ! Some waiting required of course. Ok, so the big rulebook to me is a different beast. I can see waiting with that and letting an experienced player guide you. Though eventually I think everyone needs to buy their own rulebook. Especially if you plan to travel and play, ie tournaments. That's where the slimmer rulebook comes into its own. I've run into the annoying situation where people ask me rules and I'd like to check in the book but it turns out the only guy WITH rules left 15 minutes ago.